Disney’s released a brand new trailer for the live-action version of Dumbo, set to hit theaters on March 29, 2019. 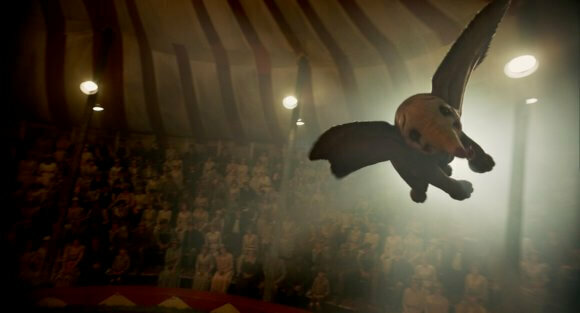 The latest trailer finds Dumbo high on a pedestal above the roaring crowd. The ringmaster introduces the act and Dumbo soars around the big top, wowing the customers. Directed by Tim Burton, the new take on the classic orphan elephant tale features a cast that includes Colin Farrell as Holt Farrier, a former circus star who finds himself caring for an elephant who can fly. Danny DeVito plays Max Medeci, the owner of the struggling Medici Bros. Circus who hopes a baby elephant will turn things around. Michael Keaton is V.A. Vandevere, an entrepreneur and proprietor behind a state-of-the-art amusement utopia called Dreamland. Eva Green stars as Colette Marchant, an accomplished aerialist who never dreamed she’d one day be soaring with a flying elephant. Alan Arkin, Finley Hobbins, Nico Parker, Roshan Seth, Deobia Oparei, Joseph Gatt, and Sharon Rooney also star in the reimagined flying elephant film. Two-time Oscar nominee Burton (Frankenweenie, The Corpse Bride) directed from a screenplay by Ehren Kruger (Ophelia, Dream House). Justin Springer, Ehren Kruger, Katterli Frauenfelder, and Derek Frey produced, with Nigel Gostelow executive producing. Circus owner Max Medici (DeVito) enlists former star Holt Farrier (Colin Farrell) and his children Milly (Parker) and Joe (Hobbins) to care for a newborn elephant whose oversized ears make him a laughingstock in an already struggling circus. But when they discover that Dumbo can fly, the circus makes an incredible comeback, attracting persuasive entrepreneur V.A. Vandevere (Keaton), who recruits the peculiar pachyderm for his newest, larger-than-life entertainment venture, Dreamland.